These days we have been suffering the effects of a big sun flare (Sunspot 2192) that has affected seriously the propagation, making the normal conditions change. In a minute the bands are opened or closed, with 28 Mhz being quiet active. Even more, last weekend was the CQ WW SSB contest, making the phone sections of the bands almost unuseable for SOTA activities. Despite all this, and being not totally recovered of my arm surgery, we chose Urregarai EA2/BI-031 as our sunday target. 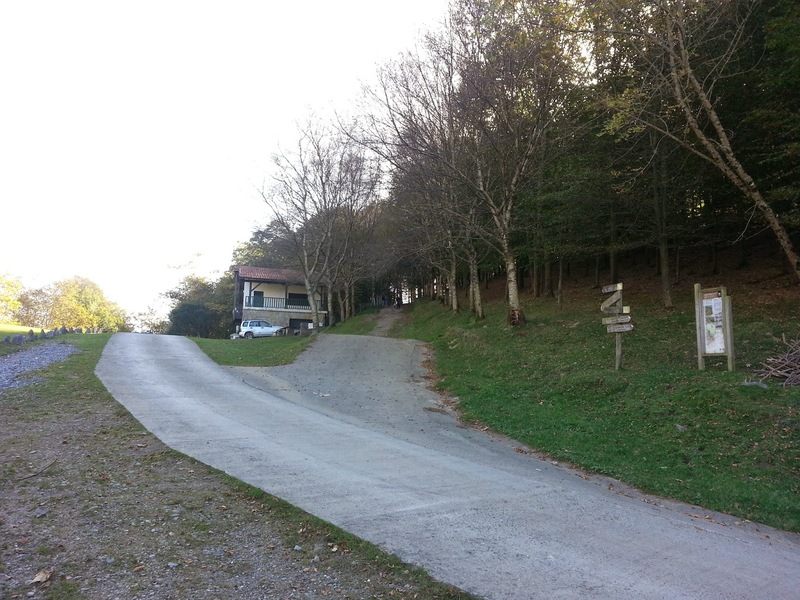 Here you can leave the car, and start the 20' ascent to the summit. The last meters are stairs (212) which drive you to the forest chapel at some 20m of the very summit. From there, the sights are amazing. 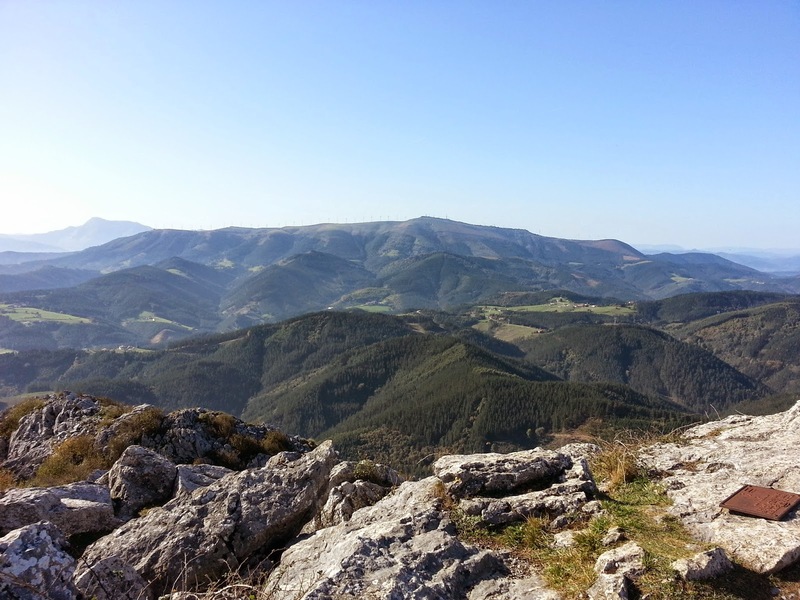 Although the summit is not very high, a lot of mountains from Bizkaia, Gipuzkoa and Navarre could be seen. The sea also covered all the north horizont, and there were no clouds all over the bluish sky, giving us an impressive view 360º around. The summit isn't too large, composed mainly of granite rocks but there was place enough to plant our dipoles. First, some VHF S2S QSOs were made with friend activators around, as Alberto EA2DYS at EA2/NV-050 Lapoblazion, Guru EA2IF at EA2/NV-053 Malkasko, Juancar EA2EEB and Teresa EA2EHK at EA2/NV-038 Illon. 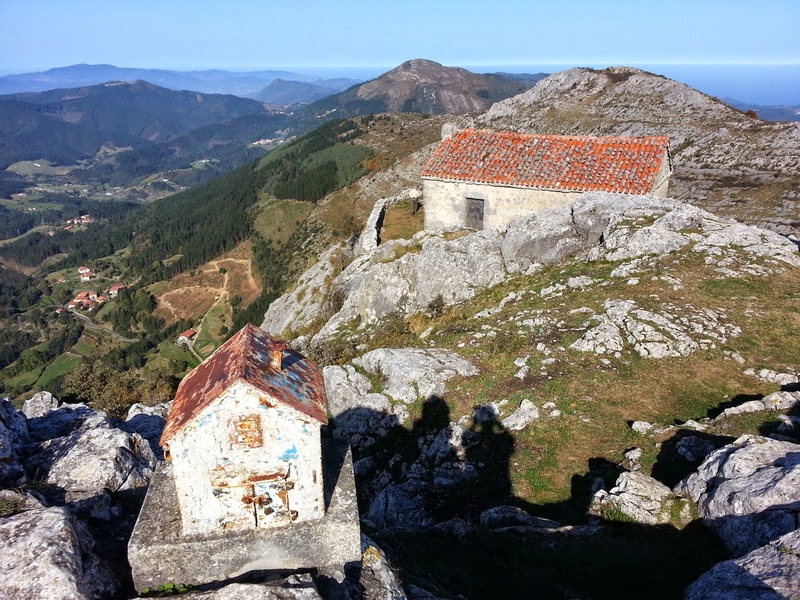 There was not clear path to Bilbao, but some QSOs with chasers from Durango and Gipuzkoa were easily made. Some very active activators like Alberto EA2DCA Iratxe EA2DNO or Javi EB2DJB didn't made the trip yesterday, but were contacted from their homes as well. Once the hf dipoles were set, we started the HF op. The results were not the best, with the propagation very unstable, due to the sunspot effects. Just a few S2S were made: Jurij S57X at I/FV-319, and Iñaki EB2GKK and Navarre, Dos Hermanas EA2/NV-131 for a complete, but with very poor signals on 24 mhz. Kurt HB9AFI was also listened and worked at Guggchnubel HB/LU-017. These all thanks to the rest of chasers that waited and helped to make the valuable S2S QSOs in such bad conditions. Some water, bananas and chocolate made our lunch. Unfortunately the summit was full of small flies which made the activation pretty uncomfortable, and some three hours were more than we could resist the continuous attacks, making us leaving the summit after a last sight of the beautiful landscape.